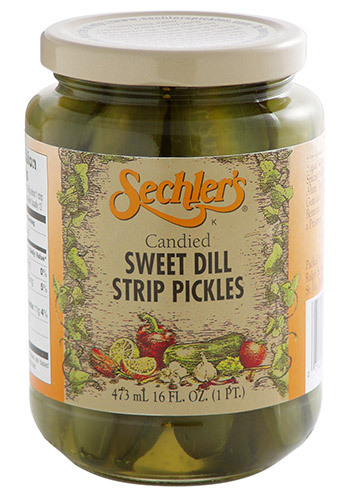 16 ounce Candied Sweet Dill Pickles are a 5 inch Strip pickle. Hand-packaged and twice sweetened with pure sugar & dill flavor. It is a Sechler's top seller! Benzoate of Soda Added as a Preservative. From Anonymous of Lee's Summit, Missouri on 4/14/2019 . The perfect pickle for making egg salad or potato salad makings. Adding just the right amount of sweetness to go with a good mustard base. Even a nice twist on those burgers when everyone else is going straight dills. From Scott Mullenix of Indianapolis, Indiana on 3/9/2019 . From Anonymous of WAXAHACHIE, Texas on 2/7/2019 . Love your pickles! They have stopped selling them at the grocery store again, so we will buy them online! From Mike Boone of Livingston , Texas on 1/29/2019 . fellow Hoosier looking for a taste of home. From Charles Kehrt of Dallas, Georgia on 1/14/2019 .